The Rip Curl Cup Padang Padang is not your grandpa’s surf contest. So it’s no coincidence that A-list talents like Bruce Irons, Jamie O’Brien and Clay Marzo, who typically shun contests like a bad Tinder match, clamor for an invitation to the Ultimate Tuberiding Contest. This year's Rip Curl Cup was arguably the best show yet: Four perfect 10s; a 12-second Houdini barrel by Bruce Irons as Mason Ho and Clay Marzo went berserk in the channel; Mason Ho’s backside spitter to 360 air; “more 9s and 10s than a Victoria’s Secret catalog,” as event commentator Dave Wassel proclaimed; and a fairytale finish that saw local boy Mega Semadhi rise to the top of a stacked final of international superstars at his home break, to the delight of the massive crowd erupting on the beach. Yep, the 2016 Rip Curl Cup had it all. If you missed the live webcast, here’s your chance to taste some of the magic that was on offer at Padang Padang on Tuesday. Feast your eyes on the tube party that was the 2016 Rip Curl Cup. We already can’t wait until next year’s blockbuster at Padang Padang. Replay all your favorite moments from the 2016 Rip Curl Cup via the Heat Analyzer. Mega says his plan is to win the title two more times before passing his coveted event spot to another local surfer. 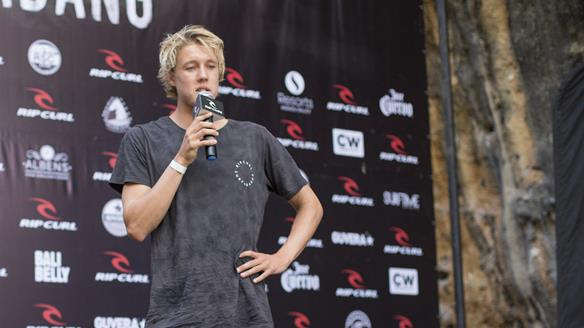 Expect Lee to bag some roaring tubes at the Rip Curl Cup in 2016. Garut Widiarta figured the best way to prepare for the toughest contest of his life would be to train with a world-class sparring partner – or two. 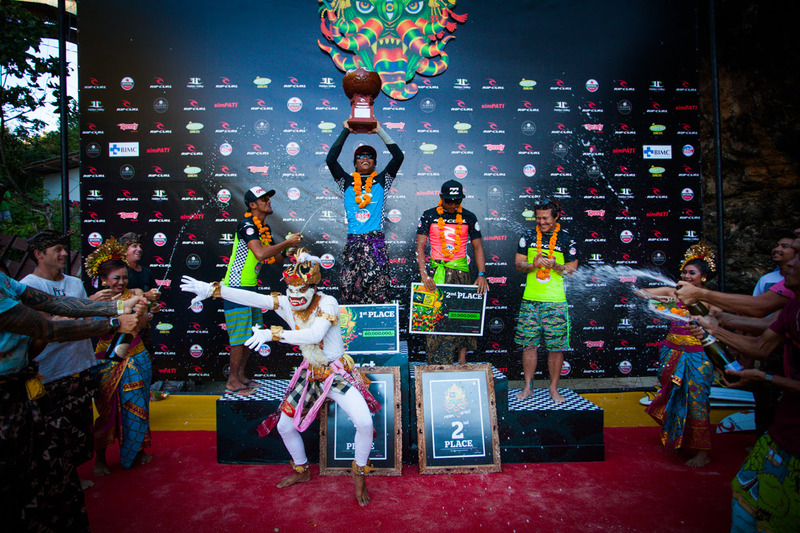 But in the end, despite the electrifying performances from the many big-name international surfers in the draw, it was the local boy Semadhi who once again kept the Cup in Bali, to the delight of the Padang Padang locals who sang a spirited rendition of the Indonesian national anthem, led by Semadhi’s mother on the awards podium. For Mega, however, the victory wasn’t about country or patriotism, but about celebrating his beloved Padang Padang. 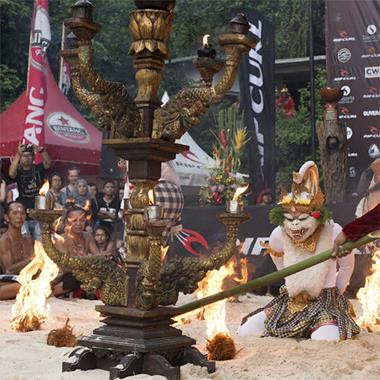 The world’s best tube riders convened at Padang Padang on Sunday to bless the 2016 Rip Curl Cup with a traditional Balinese style ceremony. If the latest swell arrives as forecast, their prayers could be answered tomorrow. Coolangatta, Queensland/AUS (Friday, July 29, 2016) – Garut Widiarta figured the best way to prepare for the toughest contest of his life would be to train with a world-class sparring partner – or two. So the reigning Rip Curl Cup Padang Padang champion, who will defend his title in August against the most lethal lineup of invited surfers in the event’s history, called up good friends fellow Rip Curl Searchers Gabriel Medina and Matt Wilkinson to train this past week at a remote jungle reef pass known for serving up some of Indonesia’s longest and most powerful barrels. Wilkinson, currently sitting atop the WSL world rankings, and Medina, the 2014 world champion and current world No. 3, were in a similar position as their friend Garut: looking to stay sharp heading into the next WCT event at Teahupo’o in a few weeks (Aug 19 – 30). The WCT pack leaders jumped at the opportunity for a Teahupo’o dress rehearsal with Garut in some heart-racing reefbreak barrels. 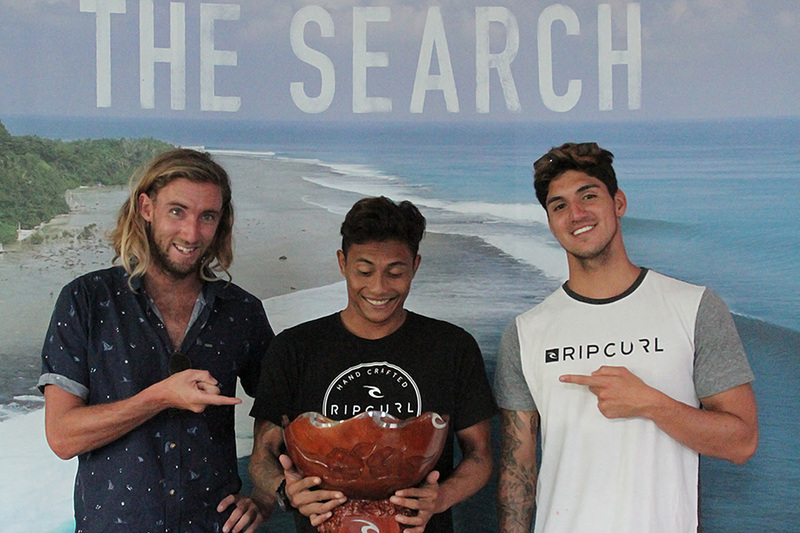 After trading 8-foot jungle barrels back and forth for the duration of the swell, the sparring partners returned to Bali over the weekend, and on Monday Garut invited them to Rip Curl Asia headquarters to learn more about this year’s Rip Curl Cup Padang Padang and show off his trophy as reigning champion. After reviewing the lineup of invited surfers to this year’s event, Wilkinson said he’s keen to have a go in the near future. 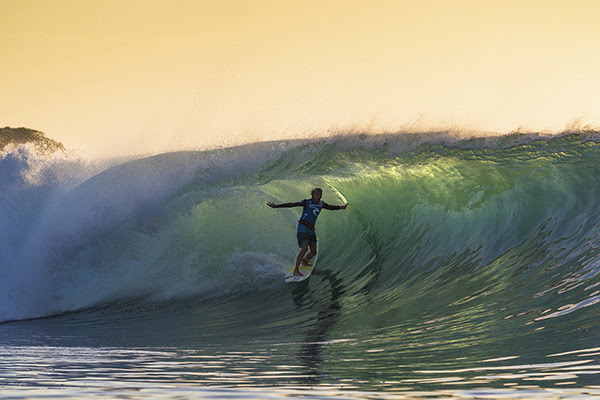 With the WSL officially adding the Rip Curl Cup to its stable of world-class surfing events in 2016, CT surfers such as Medina and Wilkinson could potentially meet Indonesia’s finest surfers like Garut in the coming years at Padang. The Rip Curl Cup trials are slated to run at Padang on the best day of surf conditions this week (waves permitting) and the opening ceremony is set for Sunday, July 31 at 3 PM local time. A potential contest swell is already looming for the start of the holding period (the window runs from Aug. 1-31), and contest directors and official event forecasters at Coastalwatch.com are monitoring the swell closely and could change the official event status to amber, or “on call,” by Friday. With the contest potentially running as early as next Tuesday (Aug. 2), Garut is battle-tested and ready for his title defense. Meanwhile, his training partners Medina and Wilkinson will be watching to see how Garut’s preparation pays off. The 2016 Rip Curl Cup Padang Padang will be webcast live to the world atlive.ripcurl.com. Fans can also visit the site to check real-time contest status and video updates from Bali. 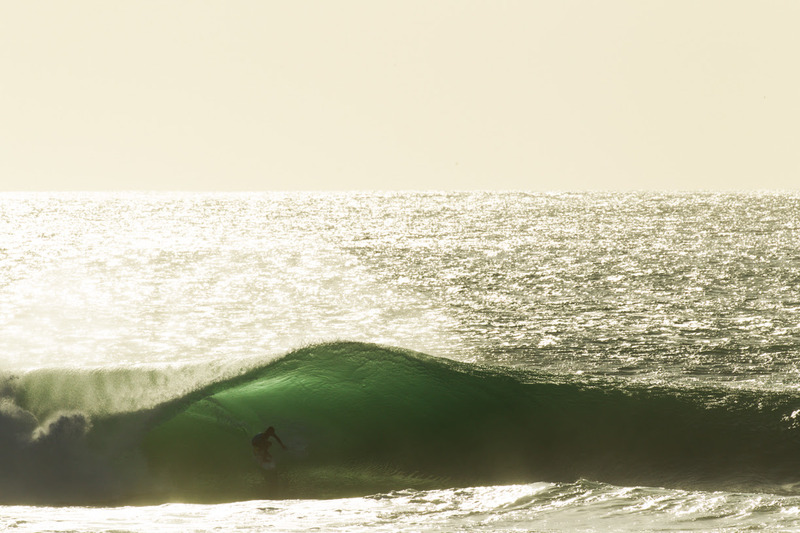 The world’s greatest tube riders are on their way to Bali for the Rip Curl Cup at Padang Padang – and so is the swell. 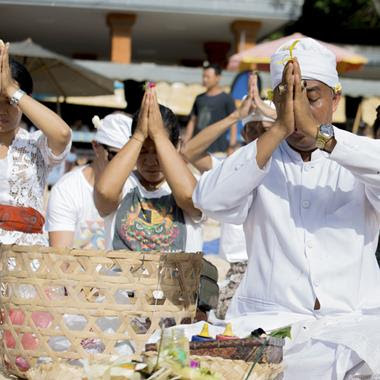 The 16 invited surfers to the Rip Curl Cup will gather at Bali’s most revered wave on Sunday (July 31) for the event's opening ceremony, heat draw and blessing. Meanwhile, a large Indian Ocean groundswell is currently following them to Padang Padang and contest directors are targeting a potential Tuesdaymorning (Aug. 2) start to run the hallowed Rip Curl Cup. 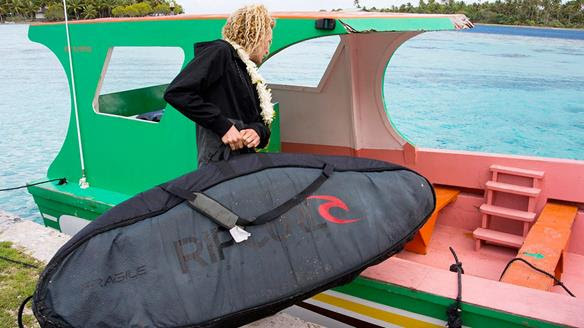 From the opening ceremony to the wrap party, everything you’ll need for a trip to the Rip Curl Cup. 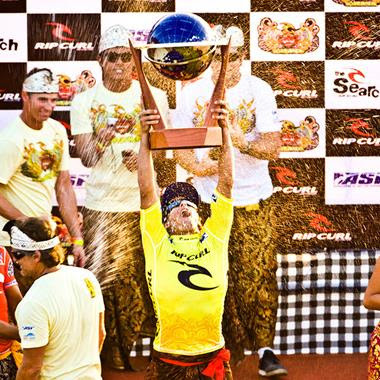 Coolangatta, Queensland/AUS (Tuesday, July 26, 2016) – A three-time World Champion, five Championship Tour (CT) event champions and four Indonesian national champions are among the all-star lineup of surfers vying for the 2016 Rip Curl Cup at Padang Padang. Rip Curl have officially announced the 16 surfers invited to compete in this year’s event, to be held on the best day of waves at Padang Padang during the month of August (the official waiting period runs from Aug. 1 – Aug 31). Among the world’s best surfers preparing to push the limits of tube-riding in pursuit of the prestigious title are three-time world champion Tom Curren (USA), North Shore charger Mason Ho (HAW) and former CT superstar and style icon Bruce Irons (HAW). Among the surfing luminaries representing Indonesia are defending Rip Curl Cup champion Garut Widiarta, Indonesian surfing ambassador Rizal Tandjung and two-time Indonesian champion Lee Wilson. With the WSL officially adding the Rip Curl Cup to its calendar of world-class surf contests in 2016, it was inevitable that this year’s contest would feature the most potent cast of surfing all-stars in its 13-year history. In addition to Curren, Ho and Irons, goofyfoot tube assassins Damien Hobgood (USA) and Clay Marzo (HAW) will also be making their inaugural assaults on the Padang Cup. Meanwhile, reigning Rip Curl Cup champion and pride of Balinese surfing Garut Widiarta said he welcomes all challengers. The final remaining invitation will go to the winner of the local trials, to be held at Padang on the best day of surf conditions between July 25 and July 30 (Note: If the waves at Padang don’t meet Rip Curl Cup standards for the trials, the previous year’s trials winner will gain entry to the main event). The winner of the trials, featuring a hotbed of Indonesian surfing talent including Oney Anwar, Darmaputra Tonjo and Marlon Gerber among others, will gain entry to the main event and the chance to compete for one of the most coveted titles in surfing. 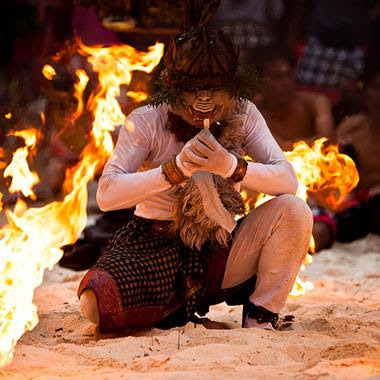 The “Padang 16” will gather on the sands of Padang Padang on July 31 to participate in the time-honored opening ceremony, blessing and heat draw. Surf fans will undoubtedly be salivating to see what big names wind up going head to head in Round 1 matchups. The “Padang 16” and fans around the world now turn their attention to Coastalwatch.com, official surf forecaster for the 2016 Rip Curl Cup. When the Coastalwatch forecast team and event directors identify the optimal “Padang swell” brewing in the Indian Ocean, the green light will be given and the world’s best tuberiders will convene at Padang Padang to battle it out for the world to enjoy. The contest will be run entirely on one epic day of waves falling between Aug 1 and Aug 31. Coolangatta, Queensland/AUS (Wednesday, July 6, 2016) – The World Surf League is excited to announce they will be teaming up with Rip Curl as part of the 2016 Rip Curl Cup Padang Padang at the wave also known as the ‘Indonesian Pipeline’ on Bali’s beautiful Bukit Peninsula. It will be the first time the WSL have been apart of the event, which is running for its 13th year. In a unique format, the WSL ‘Specialty Event’ will have a waiting period that will run for the entire month of August. The event it self only takes one day to run, meaning contest directors have a month to pick the most perfect swell and dreamy conditions to run Bali’s ultimate tube-riding contest. Being the longest running professional surfing contest in Indonesia, having the WSL on board as a sanctioning partner was a no-brainer according to Rip Curl Southeast Asia Marketing Manager James Hendy. 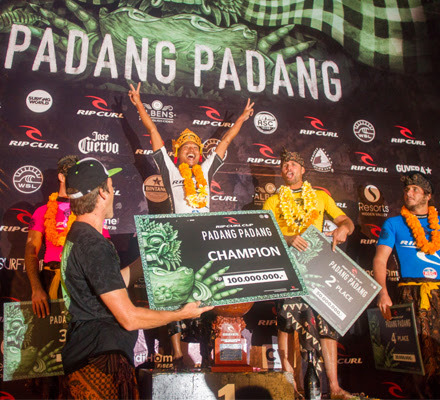 Local surfer and Padang Pagang standout Garut Widiarta is the defending Rip Curl Cup champion. Although dominating during every swell at his home break, Widiarta is always nervous about taking on the best tube-riders on the planet. The name Ho in surfing is synonymous with threading huge barrels, particularly on The North Shore of Oahu, Hawaii. 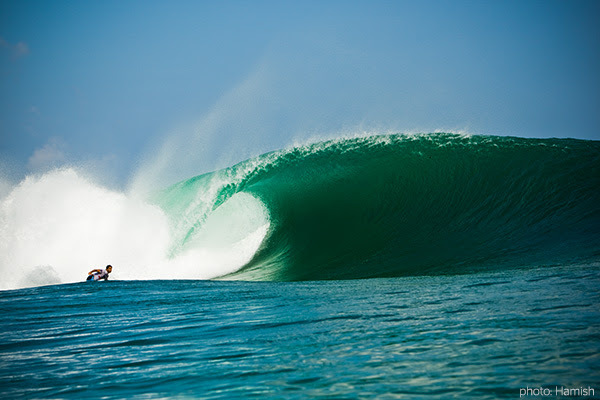 In recent years, one of the youngest of the Ho dynasty, Mason, has been a standout during the Indonesian swell season. 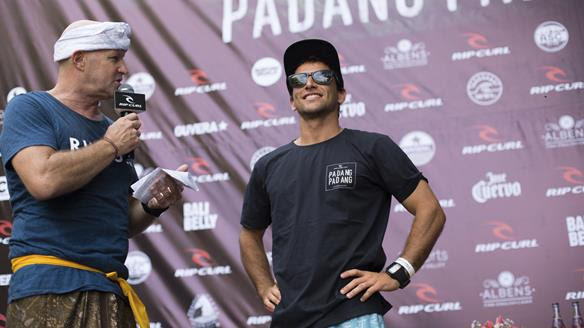 It is no surprise then that he will compete in his first Rip Curl Padang Cup in 2016. New for 2016, the Rip Curl Cup will feature the most exclusive field in event history: just 16 invited surfers; eight of Indonesia’s finest and eight of the world’s elite. The official invite list will be announced on July 18th. Contest organisers have adjusted the event format in 2016, so that after the two opening rounds, all heats will be man-on-man to eliminate hassling for waves and ensure that it's all about who can come out of the craziest barrels. 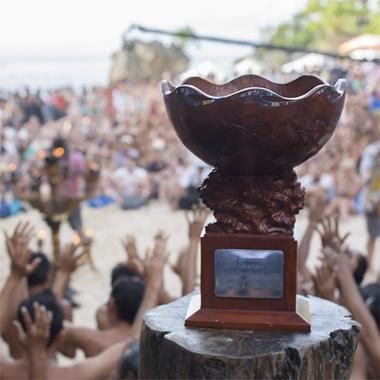 With the unknown variables involved in surfing contests and dealing with nature and the ocean, the new Rip Curl Padang Cup format will ensure a fairer playing field and increased opportunity for action. Despite flawless four-to-five-foot waves on offer this morning Rip Curl Cup organisers have decided the event will not be in run in 2015. In the interests of the Cup's integrity Rip Curl would rather not see heats go ahead than have them fought out in anything other than firing six-to-eight-foot conditions, as a mark of respect to the standing of the event. In the 12-year history of the competition this is only the second time that it has not been run. "It's never an easy decision," says Rip Curl SE Asia's marketing manager James Hendy, of electing not to run. "We were really hopeful when we extended the waiting period by a day that this swell was going to deliver the goods, and we were really encouraged by what we saw last night in the expression session. Sadly the swell plateaued overnight, and with midday high tides ensuring we would have to go on hold for a couple of hours between rounds there just would not have been enough waves over the course of the day to run a fair competition. 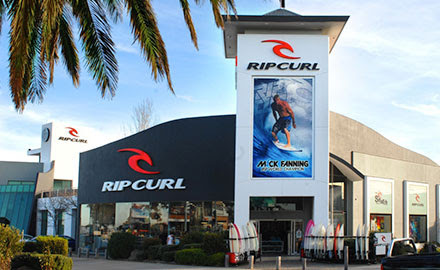 It's a hard call to make given some of the incredible tubes we've already seen ridden this morning, but sadly there's not much we can do, and everyone involved knows that it is in the Rip Curl Cup's best interests in the long term." The high calibre field in this year's event is testament to the pull that the Rip Curl Cup has with the world's best freesurfers, and we look forward to continuing our commitment to the man-on-man format when we announce our strongest ever field for the 2016 edition shortly. Thanks to all of the 2015 competitors for playing their part in another exciting Rip Curl Cup, and we look forward to seeing you all back in Bali next year. 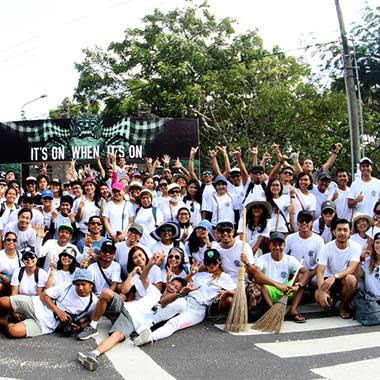 Telkomsel 4g, Indihome, Hidden Valley, Bintang, Albens Cider, OctaFX, GrabCar, BIMC and Project Clean Uluwatu. Sizeable swell hitting Bali on September 1, Rip Curl Cup placed on standby and ready to roll! Pat Curren Warming up for the Rip Curl Cup’s anticipated start earlier this week. With conditions looking promising for a Padang Padang swell to strike Bali at the end of the month the Rip Curl Cup has been put on standby, with contest directors looking at potentially running the one day competition on September 1st. 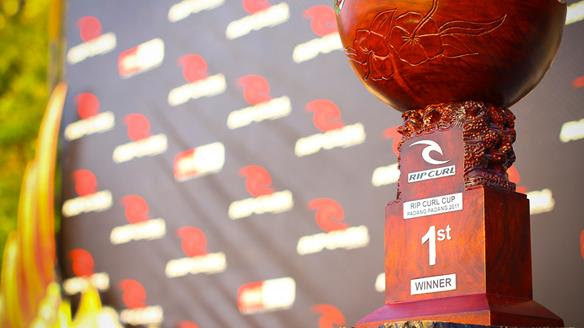 Although technically coming after the waiting period concludes, Rip Curl have made the decision to extend the window by a day to ensure that if the Rip Curl Cup runs it will be up to the incredible standard we have become used to over the 12-year history of the event. According to official forecast partner Coastalwatch, "computer models have begun to fall into step on the evolution of a larger, winter-scale low pressure system over the southern Indian Ocean, early-to-mid next week." At this point it looks like the swell might land in Bali on the afternoon of August 31st, and will continue to grow throughout the following day, allowing for the Cup to run. Accordingly Rip Curl will be closely monitoring activity in the southern Indian Ocean over the next 48 hours before deciding whether the show will go on or not. Overseas competitors are packing their bags in preparation for the event, and a field that includes Jamie O'Brien, Damien Hobgood, Jay Davies and Ry Craike are reading themselves to come to Indonesia to try and steal the country's most prestigious trophy. All of the Indonesian competitors, including last year's winner Garut Widiarta and 2013 champion Mega Semadhi, are lying in wait to guard their crown, while other invitees already in Bali include three-time world champion Tom Curren, his son Pat, and the latest addition to the event line up, Harry Bryant. Eighteen-year-old Bryant hails from Noosa on Australia's Sunshine Coast, and is "stoked beyond belief to be in the field. The opportunity to surf against Tom Curren or Rizal Tanjung, or any of the other legends in the field is too good to be true. I've heard the swell is looking promising, so hopefully it continues to build over the weekend and we can run in amazing waves!" Stay tuned to live.ripcurl.com for more developments from the Rip Curl Cup, and here's hoping that at the very end of the waiting period Huey delivers the goods! 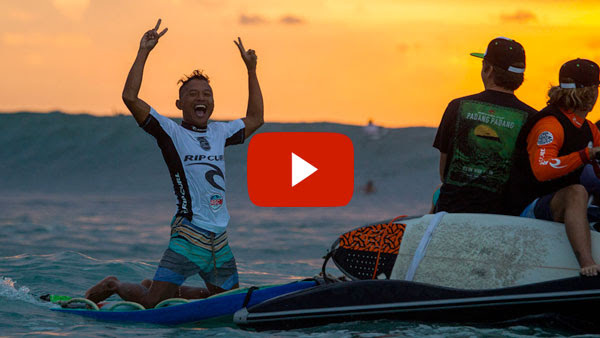 New episode of the Rip Curl Cup’s update show with potential future competitors ! The Rip Curl Cup’s very own update show, the Padang Pulse will be coming to you twice a week over the duration of the Rip Curl Cup waiting period, and will bring you freesurf footage and interviews with Rip Curl Cup competitors, all the latest event goings on, and up to the minute surf forecasts. Also check the previous episodes with Garut Widiarta, Mason Ho, Tim Bisso and Damien Hobgood on the live website http://live.ripcurl.com/ripcurlcup/ and stay tuned for all event updates.